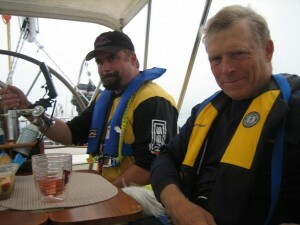 What better way to prepare for our retirement plan of living aboard Destiny than to do a long distance offshore race? 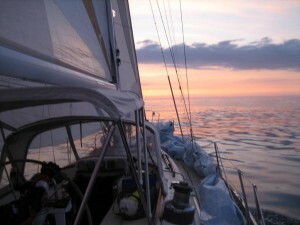 At least that was the rationale behind our signing up for the 2007 Marblehead to Halifax Ocean Race. Preparation for the race started months in advance with a required safety seminar at MIT sponsored by the race organizers that covered everything from weather to first aid to customs and immigration considerations. The voluminous written materials were invaluable. . .and daunting. What had we gotten ourselves into? 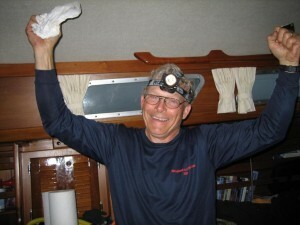 Next came preparing the boat, which included such upgrades as a new life raft and other safety equipment required by the race and which we would need for long distance cruising which was our ultimate goal. Many thousands of dollars later, we and the boat were ready to race. Our plan of a “shake down” cruise was moving forward. We were fortunate to have Kent’s sons, Spencer and Tyler agree to crew for the race–a wonderful opportunity for the brothers Bradford to spend some mano/mano time together. Kent was thrilled to have them join us, and a little apprehensive to have “three of the most important people in his life”–to quote him–dependent on him as Captain of Destiny. 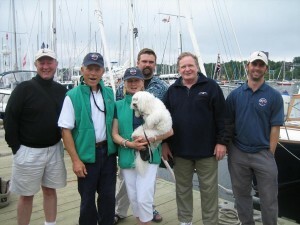 Joined by former boat partner, John Coller and long time friend, Bill Clarke, our crew was complete, except for Jolie of course who was “sea dog” extraordinaire for the trip. 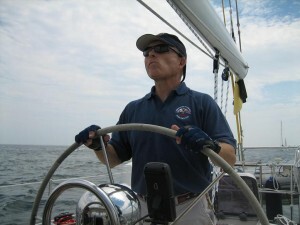 The race began early on Sunday afternoon, with several classes departing ahead of us. 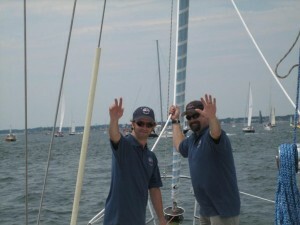 By the time our class was scheduled to leave the wind had died and getting across the start line took some effort. Everyone was in good spirits and we were raring to go, so Kent put up the light air sail that we had borrowed from a friend for the race and we moved along at a decent pace. 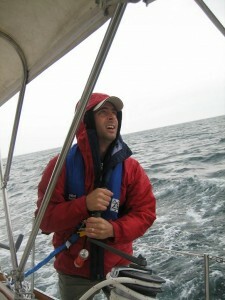 Then a few hours into the race a front came through with 20 kt. winds that built quickly. 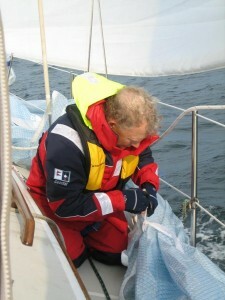 By the time the crew got the sail down it had ripped and became useless for the rest of the trip. 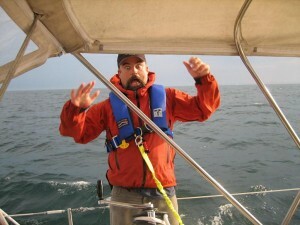 What I had been assured would be a downwind race was upwind all the way, and so the adventure began as we slogged our way to Halifax. Over the next four days before our arrival in Halifax at 4 a.m. on Thursday we experienced driving rain and high winds, followed by beautiful sunrises, fog and no wind. 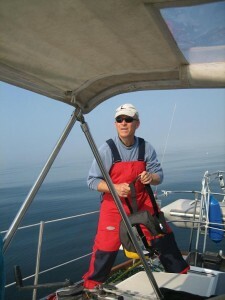 As we approached the Nova Scotia coast our knot meter was reading zero and the strong Bay of Fundy currents were pushing us backwards. 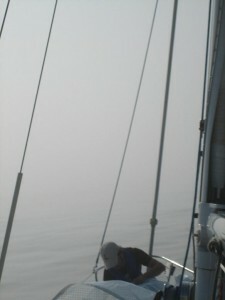 We drifted around on a sea as flat as a lake in fog. 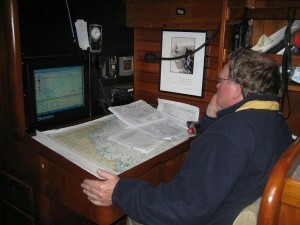 On Tuesday evening, after consulting with John Coller our navigator and considering the conditions we were in it was decided that even if the wind came up and we could make decent speed we wouldn’t make Halifax by the cut off time for the race. Kent started up the main engine which promptly died. 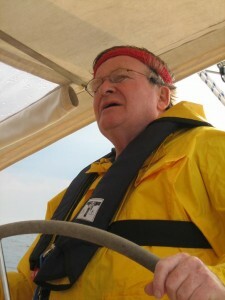 After he successfully replaced three filters, the engine still wouldn’t keep running, so he called the Canadian Navy vessel that was escorting the race for information on options if we needed assistance. By this time it was approaching midnight, and the next thing we knew “Warship 702” was a dark shadow on the horizon behind us. Out of the dark came a high speed inflatable carrying men dressed in black and wearing green glow sticks. We later joked that we were boarded by the Canadian Navy but that it was a friendly boarding. Thanks to the chief mechanic on the warship yet another filter was changed and we were on our way, motor sailing to Halifax. 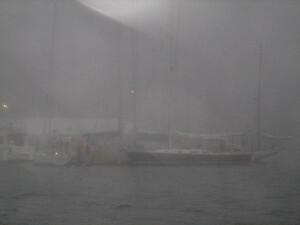 We arrived at the Royal Nova Scotia Yacht Squadron, the termination point of the race at about 4 a.m. in the morning in dense fog and were greeted with a six-pack of beer–a race tradition. 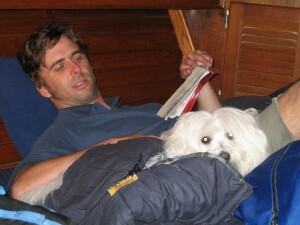 We had spent four nights and four and a half days at sea and covered approximately 400 NM. 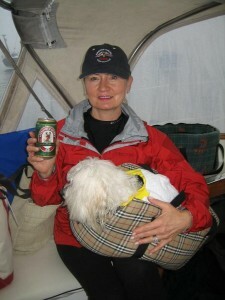 We were DNF for the race but happy to be in Halifax. The crew stayed for post-race festivities and then departed for home. 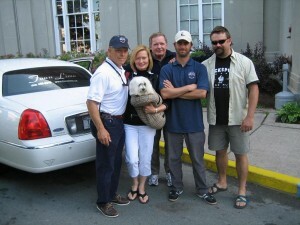 Seeing the Boys off by Limo--nothing too good for our crew! 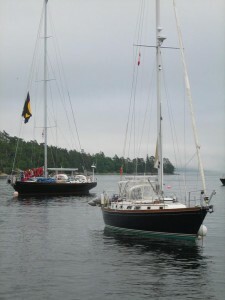 Our return trip was most memorable for the one excruciatingly long day we spent in dense fog picking our way mark to mark from Halifax to Shelburne, Nova Scotia arriving at the Shelburne Yacht Club at midnight. 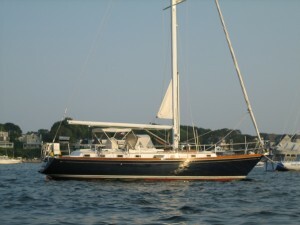 Faced with successive days of fog and needing to return to Marblehead on schedule we aborted our plan to cruise back along the Maine coast and hired a crewman we met on the race to meet us in Shelburne and accompany us offshore to Marblehead—another three day offshore passage. All in all, this adventure was as expected. We learned a lot about the boat, and about the additional maintenance that would be needed before we shove off permanently. 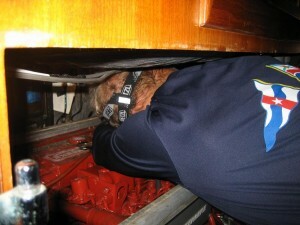 Some repairs, like a new manual bilge pump, had to be taken care of before the return trip to Marblehead. 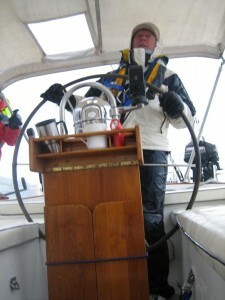 We also learned a great deal about our sailing compatibility. 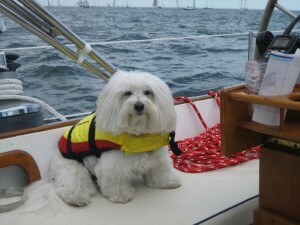 Jolie and Carol did great off shore, although Jolie still likes terra firma under her paws. Carol loved being out of sight of land. She did not love the fog, wind and rain, but with proper clothing it was tolerable. 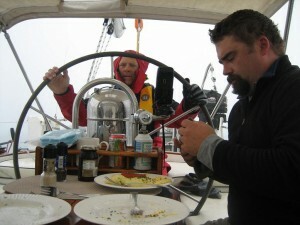 Our crew was great and reportedly enjoyed the adventure as much as we did. Only once or twice did the thought “what were we thinking” come to mind. It wouldn’t be the last time.